As you know the three resident groups CREst, CRERA and One Norbiton have successfully called-in RBK’S Decant Policy because we believe it is important that our Council behaves in a fair and decent manner to all its citizens, particularly the most disadvantaged, we hope that citizens throughout the Borough will agree to changes. However if this regeneration is to go ahead we do want to be constructive and collaborative and we present a new proposal for debate. As soon as over 250 signatures were received requesting a call-in of their decision to treat CRE residents unfairly, RBK changed the rules about permitting Change.org to be used. At 10.00 pm last night they emailed us saying that they now required either hard copy signatures or that all petitioners used RBK’s own e-petition software before they would accept any Call-in as valid. This RBK e-petition site is more awkward as it requires petitioners to register. However it can be reached using the following link. We do hope that all our members and their Kingston friends will not mind repeating the call-in using it. Also we hope that none of you will think any the worse of our current Administration for making this surprising change because our objective remains to get fair treatment for all and to achieve collaboration rather than conflict. The further 100 signatures need to be delivered to Guildhall by 5.00 pm this Friday and we have already collected over 60. Our Community Call-in Petition is Successful! Cambridge Road Estate’s three Community Groups, One Norbiton, CREst and CRERA have just successfully petitioned for a call-in of what we consider to be an unfair item in RBK’s Decant policy. This affects residents’ rights of appeal when they are being temporarily rehoused to make way for the redevelopment of their estate. Our long term aim is get everyone involved to work collaboratively on this Regeneration project. Then we might achieve “Win-Win results” for all the people of Kingston not just for RBK and any wealthy developer. If the present policy is not changed it will set an unfortunate bullying precedent throughout the Borough and jeopardise the joint support this important project needs. We believe that it would be politically naïve for RBK not to be scrupulously just to all those who are being disadvantaged by their initiatives and hope this opinion is shared by all fair-minded Kingstonians. We have had a very busy beginning to Autumn beginning with the CREst Fun Day on Saturday 2nd September. This was attended by our local MP Ed Davey and his wife Emily Gasson. Cllr Cathy Roberts and Kingston’s new mayor, Cllr Julie Pickering also came. 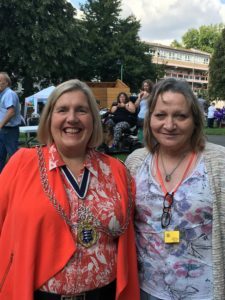 She is shown in the picture below with CREst Chair Jill Preston who has been organising these very successful community events for the past sixteen years. The Chairs of our three Community Groups, Jill Preston of CREst Harry Hall of CRERA and Mike D’Souza One Norbiton have been holding regular meetings with our local Ward Councillors Bill Brisbane LibDem, Sheila Griffin and Linsey Cottington Labour, the Deputy Leader of the Council Terry Paton Conservative and the Leader of the Opposition Liz Green Lib DEm. This is to get regular updates from Marcus Carling and his Team about the progress of CRE regeneration. With the promise of a decade or so of upheaval due to the planned CRE Regeneration,it is more important than ever for ourselves and RBK to establish a stable collaborative and constructive dialogue so that all Stakeholders can be engaged in working towards what could be a win-win situation for most participants. Now that 95% of those responding to our recent survey have endorsed our three Community groups to negotiate with RBK on their behalf, matters can be simplified. We believe that what is now needed are legally enforceable guarantees concerning Decant and Residents’ Rights to return. It is important to involve the newly appointed Pinnacle team and ensure that the Resident’s Friend works out in practice to be acceptable to Residents or can be replaced. A) That our meetings adopt standard committee rules chaired by One Norbiton unless a suitable replacement is agreed. The times, venues, minutes, background papers and agendas. 2. The items on agenda should be jointly agreed. 3. All should turn up to meetings or make timely apologies to the Chair. who they are and what their experience and brief is. 6. All discussions should be through the Chair and conducted respectfully. It might be wise for certain issues to be temporarily treated as confidential. All documents, emails etc about them will not then be shared except by mutual consent. This will apply as long as these rules are met. That we all work towards a common end that is agreed to be fair to both residents, council and developers. That, if possible, the latter should be an (embryonic) London wide “DevCo” * rather than any commercial concern solely motivated by maximisation of profits. While RBK obviously has a duty to talk to every individual resident to establish needs etc. it should only consider the joint panel of the three residents Groups, CREst, CRERA and One Norbiton, as having been elected to give opinions on behalf of all CRE residents. The three Resident Groups may apply jointly for grants from the HRA to defray costs (e.g. for stationery) to undertake independent resident’s surveys etc. consulting over regeneration issues. Finally, RBK should be transparent about its Regeneration plans and about any changes to these plans. * DevCo is a proposed London wide publicly owned development company that could partner Councils to do regeneration. Sorry I have not had time to update this website before now but that is because we have been very very busy. Our bid , made last year, for One Norbiton to become Commissioned to do some of the tasks of the Resident Participation Team, was, after a three month wait, turned down by RBK. Although our offer was the most economic and did involve giving important work to our chronically disabled members, RBK saw fit to award the Contract to a company called Pinnacle owned by a Chinese Billionaire. We have just heard that Pinnacle has since been taken over by another (? larger) commercial concern. Even though it is now July, we have yet to meet any of its staff. Our full plans to create a Community Hub at the foot of Madingley tower were also turned down by RBK but we are going ahead with a very much more limited scheme simply to enlarge our meeting room and create a Disabled toilet. We are at present awaiting a peppercorn lease from RBK. to see all the latest results. For over a year now, every Thursday afternoon in Queen Mary’s Hall from 1.00 pm to 3.00pm and every Tuesday from 12.00 to 2.00pm in Piper Hall, CREst and One Norbiton have been jointly helping run a service for the local homeless. For six months, we allocated most of our free hours to the group when RBK began requesting £450 rent for Queen Mary’s Hall. The group was originally set by Angel Levick and the MOT (Moving on Together) recovery group and has been financially supported £30 a week by Kingston Wellbeing via the WDP (Westminster Drug Project). Recently Sainsbury’s (Sury Basin branch) has started donating food which is shared between the two days. We are providing all-comers convivial encouragement with meals, music, hair dressing, First Aid and helpful advice – particularly for those with addictive disease, and well over 160 people have attended so far (About 50 a week). Attendees have been helping research to update our i-bet-me App based on earning credit for helping themselves and others. We are measuring Quality of Life with our simple faces scale that we also used in our Survey on Regeneration. In all together with a local support group on Thursdays Jill Preston (CREst) on Tuesdays have served over 1,178 meals. I will shortly be writing up a full report for publication. One Norbiton has been told that for the next four weeks from 20th March,regular drop-in surgeries are being held in Piper Hall on Mondays and Thursdays from 2.30pm to 5.00pm and on Tuesdays from 12.30pm to 3.00pm to explain what is happening. Also late evening sessions can be booked by emailing CRERegen@kingston.gov.uk. The One Norbiton Board have just sent a letter to RBK’s Residents Participation Team accepting their offer to have a peppercorn rental on the Madingley Community Shop and enlarge the office space to create a Community Hub and internet Cafe. This is the culmination of over three years planning. We will be seeking help to raise funds for this project via crowd-funding and grants and welcome any ideas and help from our members. David Ryder-mills and Geraldine Burgess were both unanimously re-elected as Company Directors.